The Dutch and Belgian royals aren't the only ones state-visiting at the moment. King Felipe and Queen Letizia of Spain are on their first state visit to their neighboring Iberian nation, Portugal. Here's a look at the jewels (including a surprise tiara!) that we saw yesterday as the visit kicked off. Felipe and Letizia began the day in Porto. The day's engagements included a visit to a Joan Miro exhibition and a trip to the Chamber of Commerce. 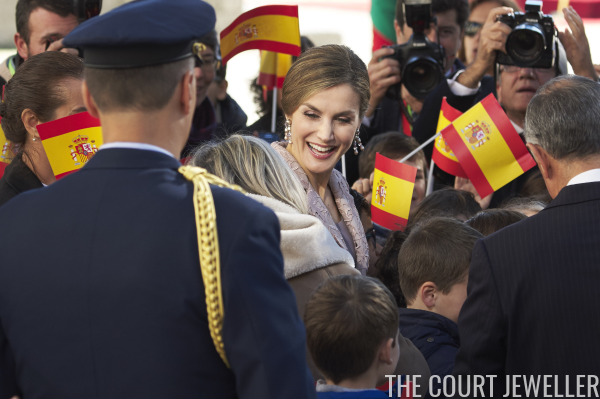 Here's a look at Letizia's earrings for the day, which were a bit more whimsical than her usual daytime state-visit jewels. 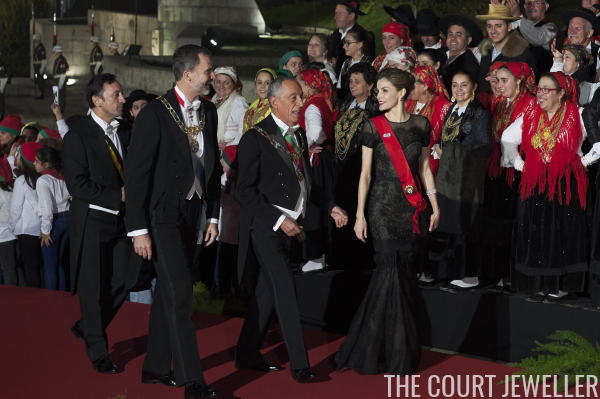 Yesterday evening, a state dinner was held at the palace in Guimaraes. As you can see, the men are wearing white tie, but Letizia opted not to wear a tiara. King Felipe wears the collar of his highest Portuguese order, the Order of the Tower and Sword, as well as the sash of the Order of Charles III and the necklet of the Order of the Golden Fleece; Queen Letizia wears the dark red sash of Portugal's Order of Christ. Instead, she wore other pieces of diamond jewelry, including her diamond wedding earrings and her Cartier diamond bracelet. Here's a pretty good view of the diamond clip brooch that she used to secure her order sash. And here's another look at the entire ensemble. 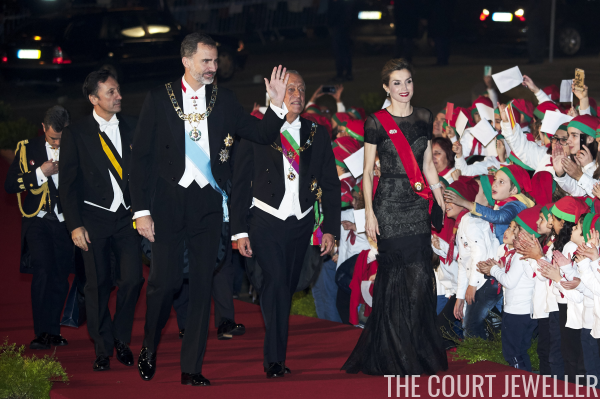 Letizia may not have worn a tiara, but another prominent guest did. Although Portugal hasn't had a monarch in more than a century, the Duke of Braganza is head of the royal house that used to rule the nation. He and his wife, Isabel, both attended the dinner. 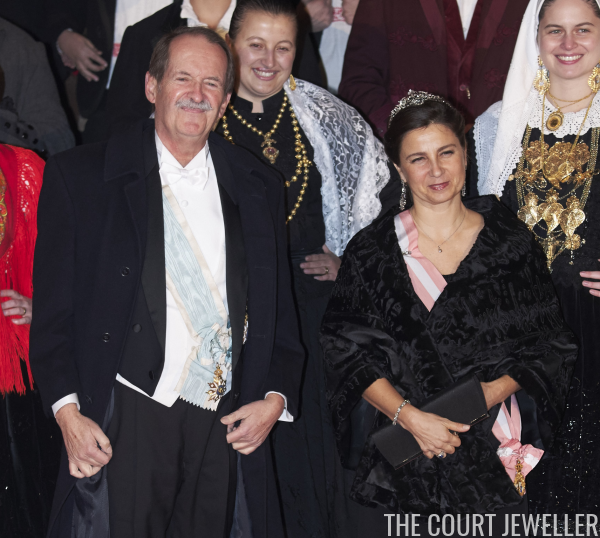 The Duke wears the sash of the Order of the Immaculate Conception of Vila Viçosa; the Duchess wears the Order of Saint Isabel. 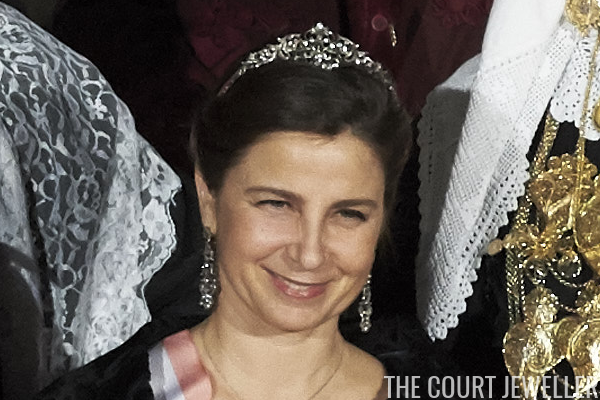 Here's a closer look at Isabel's tiara, which is a convertible diamond floral necklace. She also wore diamond earrings, a small pendant, and a diamond bracelet, and she secured her order sash with a diamond brooch.